I took a course offered by Spoonflower.com during December 2015 which focused on beginning fabric design. It started by having us collect images on an inspiration board on Pinterest. I had fun taking photos of the late fall colors in the woods in my neighborhood and looking at fox photos online. Christmas projects diverted my attention so I didn't sit down to work on my designs until this month. Here is the result! This is "Fox and the Four Seasons". I drew the designs in pencil, inked the line drawings with a black Pigma Micron 05 pen and then using the copier to transfer it to watercolor paper. The apple design was colored with Koi Watercolor Brush Pens and the fox panels were painted with guache paints. The design was finished in Adobe Photoshop and the uploaded to Spoonflower.com. This design is printed on an affordable fat quarter (FQ) panel available at Spoonflower.com (click the design name link at the beginning of the last paragraph). The FQ can be cut into 4 quilt blocks finishing at 8" if you are careful or a bit smaller if that's easier to do. 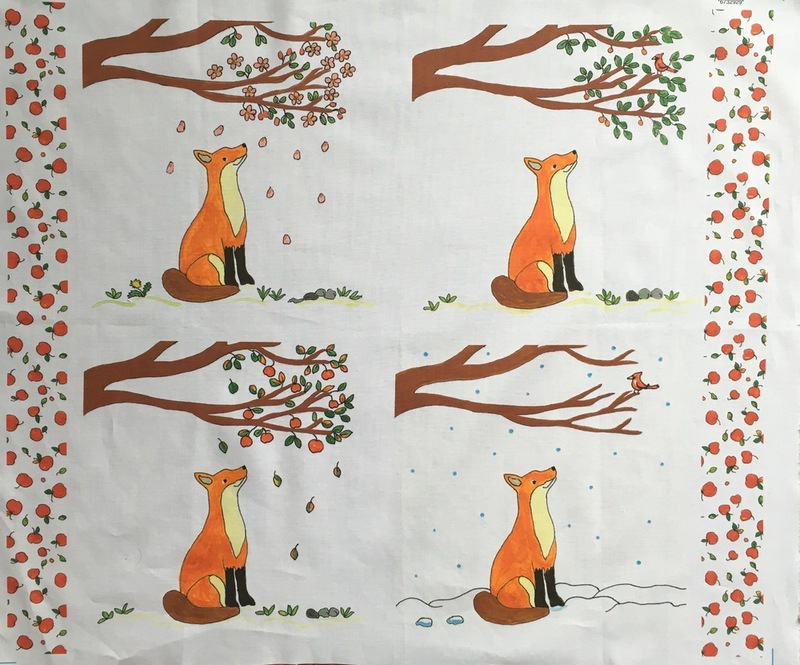 Each panel shows a fox looking up at the apple tree in my yard during Spring, Summer, Fall and Winter. A cardinal is in the apple tree in the Summer and Winter. There is also a coordinating "Tossed Apples and Dots" fabric. There was a some unused space on the FQ panel so I added a couple bonus strips of the "Tossed Apples and Dots" design. The bonus "Tossed Apples and Dots" strips are 1 3/4 inches wide. Cutting the strips with an additional 1/4 inch of white on the outer edge will make it possible for the strip to finish at 1 1/2 inches wide. This panel could be used to make wall hanging or as 4 blocks in a crib or lap quilt. I think the design blocks would look great paired with log cabin blocks. The panel could also be used without being cut into blocks. Bias strips could be used to create window panes. The seasons could also be separated by quilting. Lots of possibilities! Please do let me know if you make something with these fabrics!